The 2008 Football League Cup Final was a football match played on 24 February 2008. It was the first League Cup Final to be played at the new Wembley Stadium, and the first to be played in England since the old Wembley was demolished in 2000. The defending champions were Chelsea, who beat Arsenal in the 2007 Final at Cardiff's Millennium Stadium. 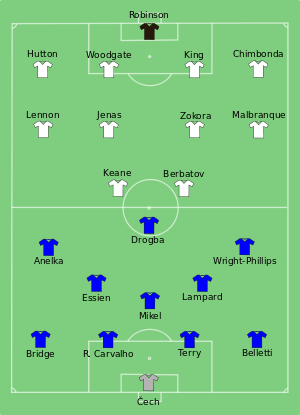 The final was contested by Tottenham Hotspur, who beat Arsenal 6–2 on aggregate in the semi-final, and Chelsea, who beat Everton 3–1 on aggregate. Tottenham Hotspur defeated Chelsea 2–1, after extra time, winning their first trophy in nine years. Chelsea took the lead in the 37th minute through a Didier Drogba free kick. This goal made Drogba the first player to score in three League Cup Finals, having also done so in 2005 and 2007. A Wayne Bridge handball gave Tottenham a 68th-minute penalty, and Bulgarian Dimitar Berbatov converted from the spot. Three minutes into extra time, Jonathan Woodgate headed a Jermaine Jenas free kick onto Petr Čech, who in turn pushed it straight back onto Woodgate's head to score the winning goal. The win was an important one for Tottenham as they secured UEFA Cup qualification for the following season, something they would not have achieved in the Premier League, as they finished 11th. For Chelsea, it was the second of four competitions in which they would finish as runners-up that season, after they lost to Manchester United in the Community Shield and ended up finishing as runners-up to the same team in the Premier League and the UEFA Champions League. The Tottenham players celebrate after having won their first trophy in nine years. Didier Drogba's goal made him the all-time leading scorer in League Cup Finals with four. He also became the first player to score in three League Cup finals and the first to score in three consecutive English domestic cup finals. ^ a b "Alan Hardaker Trophy Winners". The Football League. 26 February 2012. Archived from the original on 21 April 2012. Retrieved 8 May 2012. ^ a b c d e f "Carling Cup officials announced". football-league.co.uk. The Football League. 29 January 2008. Archived from the original on 6 March 2009. Retrieved 30 January 2009. ^ a b Stevenson, Jonathan (24 February 2008). "Tottenham 2-1 Chelsea". BBC Sport. British Broadcasting Corporation. Retrieved 20 February 2014. ^ "League Cup Fixtures". BBC Sport. 17 December 2009. Retrieved 22 January 2008. ^ "Chelsea 2–1 Arsenal". BBC Sport. 25 February 2007. Retrieved 23 January 2008. ^ Sanghera, Mandeep (22 January 2008). "Tottenham 5–1 Arsenal". BBC Sport. Archived from the original on 27 January 2008. Retrieved 23 January 2008. ^ Chowdhury, Saj (23 January 2008). "Everton 0–1 Chelsea". BBC Sport. Archived from the original on 27 January 2008. Retrieved 23 January 2008. ^ "Tottenham 2-1 Chelsea: Woody nods winner". ESPNsoccernet. ESPN Inc. 24 February 2008. Retrieved 8 May 2012.